Those skilled in the arts of kite-energy systems would be aware of water analogues. Towable underwater kite US 6612254 by Brian Frank Arthur. Filed: Nov. 7, 2000. TROLLING UNDERWATER FISHING KITE US3613290 by Clissolde l. LOUTHAN. Filed: Feb. 24, 1970. Underwater fishing kite US2566029 by Clissolde l. LOUTHAN. Filed: Mar 7, 1950. US1371836 by Eugene Antz. Filed: Oct 21, 1919. Groudgen, that is, the power transmission goes through a universal joint to some remote load, anyone's choice of load. Generate fulfillment of any task needing rotary-motion input. 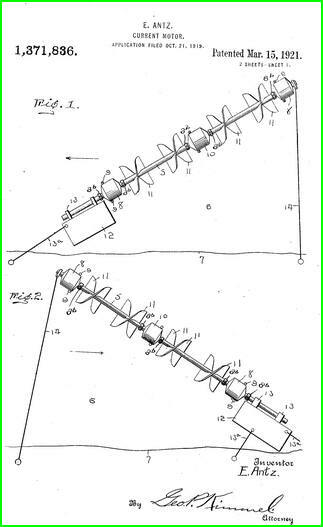 https://www.google.com/patents/US1061605 by George S. Gillett and half to Charles Black. Filed: Oct 3, 1911. Water-Motor. Uses long torque tether or flexible shaft. Groundgen. He writes only of doing water pumping.